For many parents, having a baby in the NICU is a time of uncertainty and anxiety. 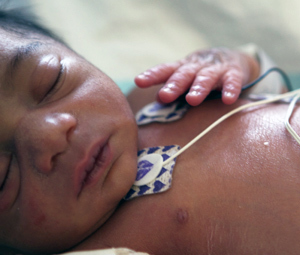 We encourage you to learn as much about your baby’s care and the NICU itself as you can. You will be better able to help your baby and relieve some of the stress you are likely to experience. What are the problems (and diagnoses) my baby is facing? Can you tell me about my baby’s treatment and daily care? What medications will be given to my baby? What types of tests will my baby receive? When will I be able to nurse or bottle-feed my baby? How often can I visit with my baby? How can I help my baby now? What special care will my baby need when we get home? When you see your baby in the NICU for the first time she will be under a radiant warmer or in an isolette, and will be connected to other equipment. That will probably be overwhelming, at least in the beginning. Nonetheless, interacting with your baby is very important to his recovery. We encourage you to touch your baby and become involved in his care as soon as possible. You are not a “visitor,” but an essential part of your baby’s care. Being with your baby means you will be away from your family, friends and other children. Your life may become somewhat chaotic, at least until you have established a routine. Please pay attention to your own emotional needs and take time out to rejuvenate yourself. It is important to find a balance between spending time with your baby and tending to the rest of your needs. Parents are welcome in the NICU at all times. You are not really visiting after all. You are part of the care team. You will receive a brochure that outlines the visiting guidelines for other family members and friends. All visitors should scrub their hands before entering the NICU, and again before touching your baby. Hand washing is very important in preventing infection. For the protection of our NICU patients, please do not bring sick friends or family into the NICU. Please consult your baby’s nurse regarding which toys and gifts are appropriate to bring into the NICU. Feel free to take pictures of your baby. Please advise your friends and relatives not to call the NICU. They should get information about your baby directly from you. Some families use social media to get the word out.